With Memorial Day weekend and the start of beach season right around the corner, thought I’d share with you some of my beach bag essentials. Whether I’m on vaca in Hawaii or headed down the Cape for the weekend, these items always make their way into my bag. Fresh Sugar Tinted Lip Treatment– I’ve raved about this tinted chapstick before, but it really is the best. I love that it gives me just a hint of color so I can have a little color at the beach without being totally made up. Plus it has SPF. Kiehl’s Ultra Facial Sunscreen Cream (c/o)– This girl is trying to avoid wrinkles as much as possible so I make sure I have a lot of protection on my face, both with hats and sunscreen. I started using this facial sunscreen during my trip to Puerto Rico and I fell in love. Celebrity gossip or style magazines– I am a recovering celebrity gossip addict- was anyone else addicted to Perez Hilton back in the day or just me? Beach days are all about relaxing so its the perfect excuse to pick up a magazine featuring your fave celebs or a style mag to indulge your guilty pleasure. Tucker Blair Card Wallet (c/o)– My beach bag (and many others) doesn’t have any pockets so this little wallet is the perfect throw in and go addition. It makes it easy to find my room key if we are at a resort or is the perfect way to hold a few bucks, your license and credit card. Tucker Blair offers so many cute options for their needlepoint wallets, like this preppy and beachy coral version. Aveeno Sunscreen– This has been of my favorite sunscreen brands for a long time. It doesn’t feel too greasy or like it is clogging my skin up. Can’t forget this guy at home if you are hitting the beach! 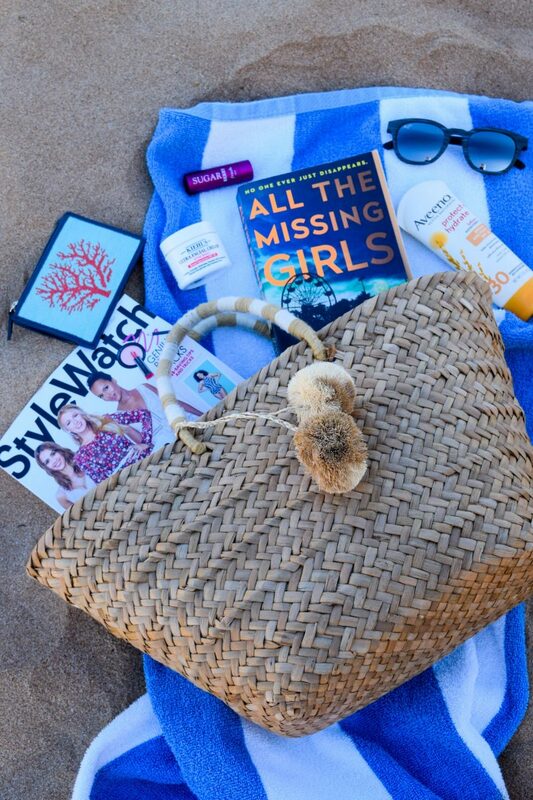 What items are always in your beach bag? Good to know about Kiehl’s face sunscreen! Also I think I need that Tucker Blair card wallet, I LOOOVE coral! Isn’t the wallet so cute?? You may need it!